The wind blew restlessly through the trees and the moon hung low and orange in the night sky. An old wooden shutter banged repeatedly against the side of the dilapidated house before me. Slowly I drew my flashlight and cautiously approached the house. There had been several reports of disturbances in the neighbourhood over the last few days and this house appeared to be at the centre of things. 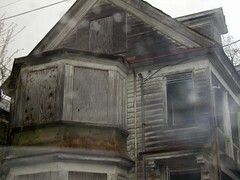 According to the county records the home had been abandoned for over five years and the place looked that way, this is except for the recently installed lock on the door. The windows where covered with dust and grime, and despite my best efforts I could see nothing of the interior. It seemed I had little choice but to venture inside if I was to have any hope of unravelling the mystery that currently plagued my desire. Although I had been living in this small town for several months the local people still treated me as though I was an unwelcome guest in their home. Even in my office of town doctor they made off handed comments as to how no matter what fancy medical training I had, I would never measure up to old Doc Bradley, who had treated them all their lives. It was in my capacity as doctor that I had first noticed these strange occurrences. Otherwise healthy patients had come down with an acute fever and sickness that seemed to defy every test I put to it. Then there had been reports of several pets found mauled to death, the local paper had even run a small article reporting that a wild animal was on the loose and that pets and small children should be kept safely indoors at nights. They seemed to be random occurrences at first glance and yet as I looked for a cause and charted the cases I noticed an odd pattern the majority of cases happened within a few block of a single abandoned home. The inquiries I made revealed little about the home except that it had been left vacant ever since its former occupant had died several years prior and so lacking any more creditable leads I decide to take it upon myself to unravel the source of the events unfolding within this small town. Normally I am not a heavy drinker but standing there at the door to this eerie place I felt compelled to take large swig from the small flask I always carried in my breast pocket. Long ago I had treated a wanted thief and in exchange he had given me a small metal lock pick which I now used to quietly unlock the door before me. Slowly it creaked open and the interior was darker then the night. It was almost as if I was entering a black hole that threatened to swallow me up, never to see the light of day again and yet I pressed into it with my flashlight held high and resolve steeled. The floor was made up of uneven wooden planks and a fine layer of dust covered the entire place except for a path leading into the kitchen which appeared to be dust free and well treed. The furnishings in the home were large and old and odd trinkets lay scattered everywhere turning the shadows cast by my light into images of bizarre misshaped beasts. As I pressed onwards into the kitchen it was as if I had walked into a solid wall of stench, so fierce that I could not help but keel over gagging, the odour was indescribable as anything other than a blend of foul orders so intense that their original components where unidentifiable. It was several minute before my nasal passages finally gave up and shutdown enough for me to enter. The kitchen was dirty and dishevelled, it was clear that the former occupant had not bothered clean up before his unfortunate demise, as pots lay still rusting in a pool of tepid water in the sink. Yet this room felt out place with the rest of the house. It was almost as if someone had gone to a great deal of trouble to make this room appear more distressed then it actually was, for despite the filth there was an uncustomary lack of dust which the rest of the building seemed to share. I began to take careful stock of the floor slowly scanning it with my flashlight when I noticed a small metal grate in a corner beside the refrigerator. As I examined it I discovered a peculiar sticky substance on the inside of the grating, reaching inside with my pen I was able to retrieve a small sample of it in hopes that it may lead to some clue as to the malady currently infecting the town. As I was standing up my flashlight slipped from my grasped and hit the floor with an echoing thud. I stared in disbelief was it possible that there was in fact another room below the kitchen floor? If so I was resolved to discover why someone had gone to the trouble of hiding it. I scoured the kitchen for almost an hour looking for some latch or lever or even the slightest trace of a trapdoor but to no avail. I was just about to give up when the realization stuck me that I had over looked a rather large possibility and so I stared at the closed door of the refrigerator. The wind had picked up and was howling through the trees and the beam of my flashlight had grown dimmer but none the less I reached out and pulled at the door. It swung open easily and instead of being greeted by rows of plastics shelves as I had half hoped instead there was roughly carved spiral stone staircase descending into darkness. Taking a second swig from my flask I made my way into the inky blackness of the stairwell and began a long slow decent. How deep it went I cannot be sure, even more puzzling was who had constructed it and why? From the look of the wall it was very old far older than even the house itself. Far below I could make out what appeared to be a dull flickering light. It gave me hope that there was in fact an end to this long decent and that I was not in fact walking into the very bowels of hell. At last I arrived at the source of the light, which came from two wooden torches fixed to either side of a large iron door. Strange marking adorned the door and there where small protrusions along its surface that seemed to resemble faces trying to push through the barrier. A large metal ring hung from the door and gripping it with both hands I pulled on it with all my might. It took all my strength to shift the great door but finally it began to create gap big enough to squeeze through. What I found inside shocked me beyond belief. There were rows of cells on either wall that appeared to have a set of cast iron bars on the front and floor of them and a system of chains and pulleys on top that appeared to be used to lower the cages to another level below. In the centre of the room was a round stone well and from it I could hear the sound of running water. Bravely I advanced across the room when all of sudden I could hear a splashing from far below. I froze in place holding my breath so as not to make even the slightest sound and listened but there was only the sound of running water and the beating of my heart. Still I braved forward and peered into the well my flashlight aimed into its depth it was not as deep as I had assumed, water could be seen clearly below and the steep slippery walls of the well extended perhaps less than ten meters. There upon the walls of the well appeared to be scratch marks carved into the stones as if by some great hand. I pulled away in fear not wanting to even imagine what could have left such marks and instead decided to press onwards into the next chamber that lay at the far end of the room. I found myself in what appeared to be a small chapel there where half a dozen wooden pews set up inside and twisted metal sculptures adorned the walls. A large altar stood at the far side of the room, long dangerous looking hooks protruded from the four corners of the altar and as I drew closer I could see traces of blood upon its surface. The sight sickened me and I had to suppress the urge to be ill. It was then that I heard the sound of something scraping against stone coming from the well room. I could feel my heart leap in my chest and quickly I scanned my surrounding for another way out and spied two doors on opposite sides of the chapel. Not wanting to test whether I had imagined the sound or if it had in fact been real. I quickly passed thought the right hand door and found myself in a curved passage way, the walls where of the same grey stone blocks that I had seen in the stairway except these had long metal tools and blades attached to them. I advanced quickly along the passageway until I arrived at another wooden door, slowly I opened it taking the time to peer inside only to discover myself in what looked like the cross between a laboratory and torture chamber. A great metal furnace stood against one wall and there were long glass tubes and containers connected to it. The jars were filled with bubbling fluids and in one large dark bottle about half my height in size I could make out some kind shape floating within. On one side of the room was a large table with tight restraints attached to it and a series of electrical nodes resting on top. Each node had a long metal spike on the end as if to skewer the unfortunate patient. I looked around the room but there appeared to be only one other way out through a wooden door similar to the one I had entered from that I was convinced would only lead me back to the chapel. Then I saw it an old red book resting on a desk the pages yellowed with age. From the cover it appeared to be a journal perhaps one that would explain the bizarre sights I had seen within this old house. Then I heard it. A slippery sound of something wet moving across stone. It was coming from behind the door I had entered through and I could feel my heart thumbing loudly in my chest. The sound was drawing nearer and its pace seemed to quicken as if sensing my presence. I quickly made a dash for the other door and ran down the passageway beyond. I raced along its curved stone surface until I emerged once again in the chapel. Not stopping to rest I decided that my only safety lay beyond the great iron door. However as I enter the well room terror gripped my body. The great iron door that had been such a challenge for me to open laid closed its massive weight had quietly and effortless swung shut. I was trapped. I could hear the sounds of something drawing nearer and the sound of claws scratching against stone coming from just beyond the chapel, as whatever pursued me drew closer. I looked around for some means of defence or escape, when at last my eyes focused upon the well. The water within was definitely moving so the current must eventually lead to some nearby river or the ocean, and with luck safety. My blood ran cold, as the sound of think heavy breathing began to grow behind me, louder and louder it seem get until it was all I could hear. I was rooted to the spot unable move for fear of what lay behind me and by the sound of rhythmic breathing, at last I felt a hot, heavy breath against the back of my neck, and it broke me from my trance. With only one option left to me I leapt into to the well pain raking across my back before I came crashing into the icy waters below. Pulled along rapidly by the current I struggled to remain above the water but the fast moving waters kept pulling me under. At last I managed to make a desperate bid for air as I broke through the water’s surface and then collapsed, letting it take me where it will. I could see nothing but darkness and hear nothing but the sounds of blood rushing to my ears. I may have blacked out who knows, but my last recollections were of sand and the sound of gulls in the distance.